UPLAND, Calif.—From the time he was a young man coming of age in the 1970s, Mike Massey could have served as a poster child for his generation, the baby boomers. He grew his hair long to the dismay of his father, surfed, played in rock bands and says he regularly got high on marijuana and cocaine. The wild times receded as he grew older. In his 30s, he stopped using drugs altogether, rose into executive positions with the plumbers and pipe fitters union, bought a house in this Los Angeles suburb and started a family. But at age 50, Mr. Massey injured his knee running. He took Vicodin for the pain but soon started using pills heavily, mixing the opioids with alcohol, he said. Today, the story of this balding, middle-aged executive continues to reflect that of his generation. Older adults are abusing drugs, getting arrested for drug offenses and dying from drug overdoses at increasingly higher rates. These surges have come as the 76 million baby boomers, born between 1946 and 1964, reach late middle age. Facing the pains and losses connected to aging, boomers, who as youths used drugs at the highest rates of any generation, are once again—or still—turning to drugs. The trend has U.S. health officials worried. The sharp increase in overdose deaths among older adults in particular is “very concerning,” said Wilson Compton, deputy director for the federal government’s National Institute on Drug Abuse. The rate of death by accidental drug overdose for people aged 45 through 64 increased 11-fold between 1990, when no baby boomers were in the age group, and 2010, when the age group was filled with baby boomers, according to an analysis of Centers for Disease Control and Prevention mortality data. That multiple of increase was greater than for any other age group in that time span. The surge has pushed the accidental overdose rate for these late middle age adults higher than that of 25- to 44-year-olds for the first time. More than 12,000 boomers died of accidental drug overdoses in 2013, the most recent data available. That is more than the number that died that year from either car accidents or influenza and pneumonia, according to the CDC. Experts say the drug problem among the elderly has been caused by the confluence of two key factors: a generation with a predilection for mind-altering substances growing older in an era of widespread opioid painkiller abuse. Pain pills follow marijuana as the most popular ways for aging boomers to get high, according to the federal Substance Abuse and Mental Health Services Administration, which conducts an annual national survey on drug use. Opioid painkillers also are the drug most often involved in overdoses, followed by antianxiety drugs, cocaine and heroin. Wall Street Journal interviews with dozens of older drug users and recovering addicts revealed an array of personal stories behind the trend. Some had used drugs their entire lives and never slowed down. Others had used drugs when they were younger, then returned to them later in life after a divorce, death in the family or job loss. Drug-rehabilitation programs are grappling with how to handle the boom in older patients. More than 5.7 million people over the age of 50 will need substance-abuse treatment by the year 2020, according to estimates from government researchers. Meanwhile, hospitals have seen a sharp increase in the number of older adults admitted for drug-related health problems, government statistics show. “We’re still in the process of figuring out: How do we ensure we have a strong workforce that can address this, and the appropriate settings to address this?” said Peter Delany, director of the Center for Behavioral Health Statistics and Quality at the Department of Health and Human Services. Over the past decade, illicit drug use among people over 50 has increased at the same time that the rate for teens—the group that draws the most public concern when it comes to substance abuse—has declined, according to the federal government’s annual survey on drug use. A similar pattern exists for drug arrests: rates fell in nearly every younger age group in the country between 1997 and 2012, but not for those between the ages of 45 and 64. 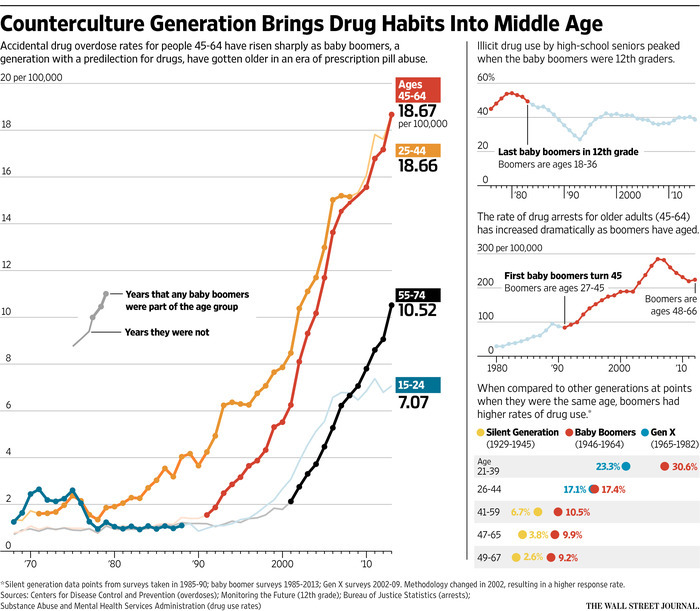 Boomers have always ranked high on the charts that measure drug use. In 1979, high school seniors, born in 1961, set the record for self-reported illicit drug use in the past year, according to an annual national survey called Monitoring the Future. The rate of drug use among boomers has fallen significantly as the cohort has aged, but it is about triple the percentage of people in the previous generation who reported drug use in their older years. Neil Howe, a historian and author of several books on generational trends, said that boomers have always stood out for their willingness to break with convention and take risks, which included using drugs. “They themselves continue to behave in a less inhibited fashion even as younger generations turn away from that type of risk taking,” he said. Rehab centers that were designed for younger people are adjusting to the new clientele. Getting rid of bunk beds, hiring more experienced addiction counselors and providing medical care on-site are some measures being taken. Amid prescription painkiller abuse, old-age aches and pains are treated with acupuncture and nonaddictive painkillers. Another change is therapy sessions that are designed for older adults. At the Hanley Center at Origins in West Palm Beach, Fla., there is a treatment program just for baby boomers separate from both older and younger adults. They live together in the same building during their stay and attend group therapy together. At one session, a woman who said she was an alcoholic told the dozen people sitting in a circle that she had received roses from her family that day. It made her feel guilty: “I really don’t deserve anything from them,” she said, breaking down in tears. Deborah Christensen, a counselor and boomer herself, then led an exercise where other recovering addicts acted out the woman’s family dynamics. In the scene, her adult daughter was the voice of reason, calming the family during frequent fights over substance abuse. John Dyben, who heads the boomer and older adult programs at Hanley, said that there are different barriers to getting each generation on the road to recovery. With the oldest generation, it is shame about admitting an addiction; with youth, it is a belief that they are indestructible. With boomers, he said, it is an attitude that they know all the answers and a belief that drugs aren’t necessarily a bad thing. To that end, counselors at Hanley put less emphasis on the traditional stories about how substance abuse ruins people’s lives when treating boomers because, “for every story you’ve got, they’ve got 15 others about people who expanded their minds with drugs and then became successful CEOs,” Dr. Dyben said. Instead, they focus on educating them about the science of addiction. They also give them a more active role in planning their own treatment. Opiates are the drug that is most frequently landing boomers in treatment, according to federal data that tracks admissions to centers that receive some public funding. In 2012 for those aged 45-64, 36% of admissions for drugs were for heroin, with an additional 12% for opioid painkillers, followed by 22% for crack cocaine, and 10% for methamphetamines. Alcohol and alcohol mixed with a secondary drug made up more than half of the overall admissions. For older adults, the side effects of getting high can be much harsher than for younger people, experts say. As the body ages, the metabolism slows, making it harder to process drugs, said NIDA’s Dr. Compton. The rates of hospital stays and emergency room visits for drug-related health problems have skyrocketed for older adults in the past two decades. In 2012, people between the ages of 45 and 64 had the highest rate of inpatient hospital stays for opioid overuse; two decades ago, it was those between 25 and 44, according to the federal Agency for Healthcare Research and Quality. For Mr. Massey, the Southern California executive, a near-overdose two years ago was one of the dramatic events that pushed him toward getting clean. One night, sitting on his bed after taking a cocktail of painkillers, he had a seizure and blacked out. “Next thing I know I was waking up and my wife was upset and my kids were crying and these paramedics were pumping on my chest,” he said. Mr. Massey’s late father, George, was a World War II vet, a tough steward in the plumbers and pipe fitters union, and a heavy drinker, said his son, who recalls him carrying his union contract, a half-pint of whiskey and a pistol in his lunch pail. After he stopped using drugs—which included a stint with meth in his late 20s—for the first time, his career took off: At age 35, he was promoted to a leadership position at a Los Angeles-based trust fund that represents the interests of unions and union contractors in the plumbing and piping industry. He met his wife, Dena, bought a home in the suburbs and had two children. Then eight years ago, while exercising to lose weight, he aggravated an old knee injury and took a few Vicodin pills from a friend for the pain. A day later, he took a handful. After surgeries to repair his knee and an arm he also injured, prescriptions brought him a steady supply of pain pills. He would down about 40 every day while drinking heavily. By that time, he had become executive director of the trust fund and several associated businesses, an organization known as the PIPE Group, which employs more than 200 people across the country. It was a stressful job probably better done by two people, said Sid Stolper, Mr. Massey’s boss for 21 years. After Mr. Massey got, in his own words, “blasted” at work on pills and alcohol, Mr. Stolper called a meeting and delivered an ultimatum: Get clean or you’re fired. At first, Mr. Massey resisted. But after detoxing for two weeks at home, he entered a two-week recovery program in San Diego. The center’s president, Tom Horvath, is a seminal figure in a rehabilitation movement called SMART Recovery, a secular, cognitive-behavioral-therapy based alternative to the 12-step approach. Mr. Massey now leads an online SMART Recovery group, and he is back at his job.